At Lamm David Eye Care, we offer the Optos Daytona Retinal Exam as an important part of our annual eye exams. The Daytona produces a clear, instantaneous image with a wide view to look at the health of your retina. Plus it is fast, easy and comfortable for all ages and no eye drops or dilation is needed! Many eye problems can develop without you knowing or having any symptoms, diseases such as macular degeneration, glaucoma, retinal tears or detachments, cancer and other health problems such as diabetes and high blood pressure can be seen with a thorough exam of the retina. The Daytona also provides the opportunity for our patients to view and discuss the retinal image with the doctor during the exam. Another great benefit is that it allows a permanent record for your file, which allows us to view your images each year to look for changes, which is crucial to most eye diseases. We are also proud to supply our patients with an Ocular Coherence Tomography (OCT). This is a technologically advanced imaging device that allows your eye doctor to instantly evaluate the health of the back of your eye, the retina, at a microscopic level. 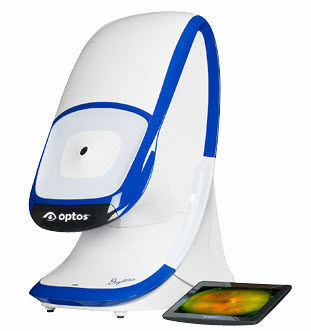 It is used to detect diseases and conditions such as diabetic retinopathy, macular degeneration, glaucoma and much more. 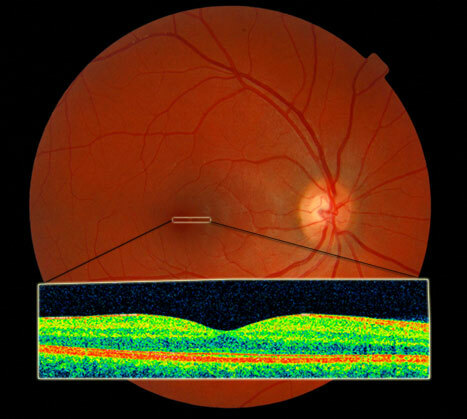 This imaging is critical to confirm the health of the retina, optic nerve and other retinal structures to diagnose disease at their earliest stages. This technology allows more successful and appropriate treatment of many eye conditions. It is also essential in assisting the doctor to detect and measure any changes to your retina each time you get your eyes examined, as many eye conditions, such as glaucoma are diagnosed by detecting changes over time.